COLUMBUS, Ohio – After watching a 13-point lead shrink to seven in less than a minute, and then watching a turnover give the ball back to a jacked-up Utah State team, Huskies basketball coach Mike Hopkins was faced with a critical decision: What kind of candy was he going to pick? On the scorer’s table next to Washington’s bench sat a handful of Werther’s Originals along with peppermint- and grape-flavored Life Savers. So during a second-half media timeout in the biggest game of his coaching career, Hopkins began the selection process. Then he reached for the grape Life Saver. Every UW fan watching at that moment was in panic mode. Hopkins was perfectly poised. He knew the Huskies could sustain any run thrown their way and knock off one of the hottest teams in the country. Then, they went out and did it. 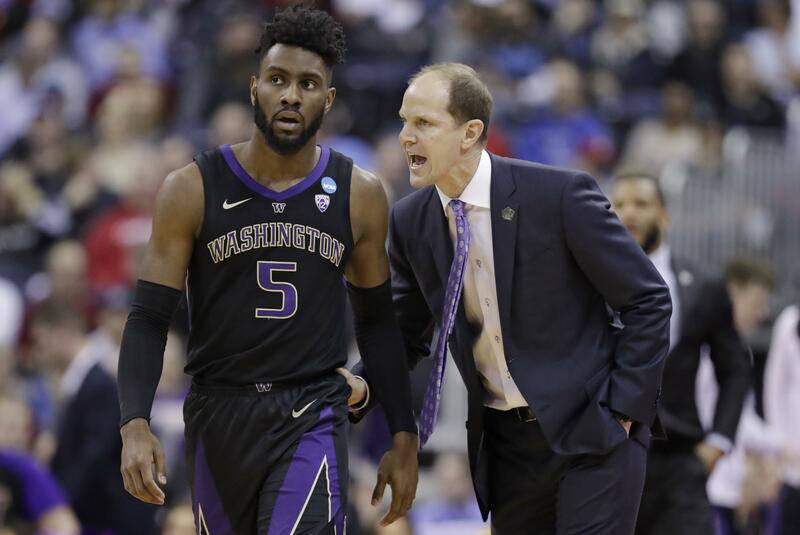 For anyone thinking ninth-seeded Washington was content in simply returning to the NCAA Tournament after an eight-year absence, it proved otherwise. The Huskies’ 78-61 first-round win over Utah State was a delectable mix of dominance and discipline. From defense, to ball movement, to vital contributions from the bench, everything that made the Huskies (27-8) successful this season was on display at Nationwide Arena. Not many considered them a team to watch in this year’s Dance. Now? After a shaky first couple of minutes, the Huskies channeled those feelings of disrespect into their best first half of the season. They toyed with a team that had won 16 of its last 17 games and took a 40-28 lead into the locker room. Most noteworthy was holding Mountain West Conference Player of the Year Sam Merrill (21.2 points per game) scoreless in the first half. In fact, they limited him to three shots. The Huskies that blitzed through the Pac-12 from early January to mid-February were the ones on the floor Friday. The ones that struggled from late February to mid-March had vanished. Pac-12 Player of the Year Jaylen Nowell racked up 19 points and five assists while going 4 of 7 from the field, 2 of 2 from deep and 9 of 10 from the foul line. Pac-12 Defensive Player of the Year Mattisse Thybulle had five steals, three blocks and countless shot alterations. They had Dickerson post 20 points and 12 rebounds. They had Nahziah Carter score 13 points off the bench. They had a big 3-pointer from Dominic Green and a crucial 11 minutes from freshman Jamal Bey. But more than anything, they had composure. The Aggies (28-7) made runs throughout the second half that sent their student section into a frenzy. The loudest cheer of the night came when Merrill knocked down a 3-pointer with 9:54 remaining to cut the lead to one. What followed were back-to-back 3s from Carter – a sophomore who entered the game shooting 28.1 percent from deep – to silence the crowd and stun Utah State. Forget the Life Savers on the scorer’s table, he was the one on the court. Utah State never got closer than six after that. Didn’t matter that point guard David Crisp fouled out with a touch over 8 minutes left, or that Thybulle played the final 7 minutes with four fouls. The Huskies weren’t going to fold. Next up for them on Sunday is No. 1 seed North Carolina, which isn’t a matchup most were expecting. Though few would pick the Huskies to win that game, after Friday it would be foolish to think that they can’t. Published: March 22, 2019, 10:13 p.m. Updated: March 22, 2019, 10:20 p.m.